Author: David Heinzmann, Tribune staff reporter. Tribune staff reporters Art Barnum, Sean D. Hamill, Karen Mellen, Tom McCann and Carolyn Starks contributed to this report. Despite a slight drop in the number of homicides in 2002, Chicago's murder rate has again far outdistanced that of New York City and Los Angeles, the nation's two largest cities. With the final hours of 2002 ticking away, Chicago had 645 homicides--down 20 from 2001 when the city led the nation. Los Angeles was poised to take that title in 2002, with 656 slayings through Saturday. But Chicago was way ahead of the pack in the murder rate--with 22.3 slayings per 100,000 people. The murder rate was 17.8 in Los Angeles and 7.2 in New York. New York, with nearly three times the population of Chicago, was likely to record fewer than 600 murders for the first time since 1963. The city had 575 homicides through Sunday. The problem in Chicago, police say, remains the persistence of gang violence related to drug trafficking. About half of the homicides were gang and/or drug related, police said. "We're looking at the gang structure to see if there's a better way to attack it," Detective Chief Phil Cline said. Cline said he hopes cooperative efforts with an FBI gang task force and the U.S. Bureau of Alcohol, Tobacco and Firearms to remove illegal guns from the streets will help lower the number of murders again in 2003. U.S. Atty. Patrick Fitzgerald has said gangs are much more entrenched in Chicago than in New York, where he worked before coming here in 2001. In Los Angeles, slayings were up more than 20 percent over 2001, and police also blame gang violence. The new police chief there is William Bratton, the former top cop in New York who is credited with slashing that city's homicides, which peaked at 2,245 in 1990. Police Supt. Terry Hillard said Tuesday he was pleased the number of murders was lower than in 2001, but that "one is too many." He did not have an answer for the higher murder rate in Chicago, which has outpaced New York and Los Angeles for all but one year in the last decade. But he said it is unfair to lay all of the blame on the Police Department. The persistently high murder rate here is a societal problem caused by a combination of guns on the streets and broken families, he said. "When politicians and elected officials really grasp the problem and make a commitment to say it's not your right to have a gun, that's the only time we're going to be able to cut the homicide rate down," Hillard said. Guns are used in about 80 percent of Chicago killings, police said. Hillard also said parents need "to step up to the plate" to set their children on the right path when they are growing up in drug- and violence-ridden neighborhoods. Last January, Hillard responded to Chicago's nation-leading 665 homicides with a promise of a crackdown on gangs and drug dealers by beefing up police presence in the most violent areas of the city. He also said the department would focus more investigative power on murders. In the last year, the department has returned to homicide units that allow detectives to focus only on murders. Cline said he hopes the teams of investigators will solve more killings this year and, in the long run, significantly reduce the number of murders in the city. Police also hope an expanded DNA database of convicted Illinois felons will help solve more pending murder cases. Through Monday, Chicago detectives had solved 44.3 percent of the murders committed in 2002, down 1 percentage point from the clearance rate in 2001, police said. In the collar counties, murders were up in Will and Kane and down in DuPage, Lake and McHenry. Take Aurora's 22 homicides out of the equation and Kane County had one slaying--in Aurora Township--in 2002. Aurora had 17 slayings in 2001. Aurora police suspect all but two of the slayings in 2002 were related to gangs, illegal drugs or domestic disputes. Aurora also was the scene of the most recent homicide in DuPage County, where a part of the city is located. Sungnam Lisowski, 41, is charged with the Christmas morning shooting of her husband, John. She also faces attempted murder charges in the shootings of the couple's two daughters. It was the ninth reported DuPage County murder in 2002, about average for the state's second-largest county, with nearly a million residents. There were 10 murders in 2001, nine in 1998 and 11 in 1999. There were no reported homicides in 2000, which officials called an anomaly. Joliet recorded seven murders and is investigating an eighth death in 2002. That's an increase from 2001, when the community had five murders. Police Chief David Gerdes said that over the last five years, the city has averaged 11 murders--down from the highs of the early 1990s, when the city routinely recorded at least 20 murders annually. Will County had 21 murders in 2002, up from nine in 2001. Sheriff Paul Kaupas said his department investigated eight of the 21 murders last year. Six of the killings were in two incidents--the two Dwight children whose bodies were found in the Des Plaines River in December and a quadruple homicide in rural Will. In that case, Brian Nelson, 20, is charged with killing his ex-girlfriend, her father, her brother and a family friend. In Lake County, homicides were down to 13 in 2002 from 19 in 2001, according to the Lake County coroner's office. Only two of those 13 homicides were the result of gunshots. "It's really hard to say why that is," said Waukegan Detective Don Meadie, who is assistant commander of the Lake County Major Crimes Task Force. "But hopefully our gun buyback program has been effective." Lake County has bought nearly 1,000 guns from residents in the last two years, which Meadie said may at least eliminate guns as an option in some domestic disputes or from being available to home burglars. In the 1980s, Lake County had as many as 40 homicides in a year, but that figure has been on a decline, reaching a recent low of eight in 2000. In McHenry County, there were three murders, down one from the year before. Elgin had three homicides in 2002 compared with eight in 2001, police said. Arlington Heights had two last year, down from three in 2001. PHOTO (color): A memorial still marks where Englewood High School student and basketball star Maurice Davis was gunned down two weeks ago. Guns are used in 80 percent of Chicago killings, police said. Tribune photo by Nancy Stone. 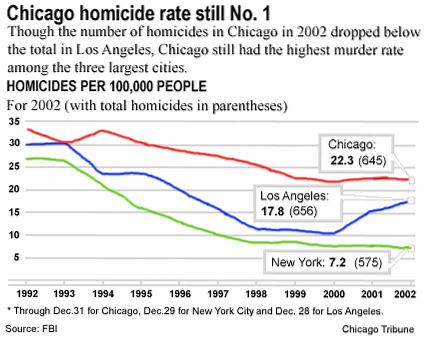 Though the number of homicides in Chicago in 2002 dropped below the total in Los Angeles, Chicago still had the highest murder rate among the three largest cities.